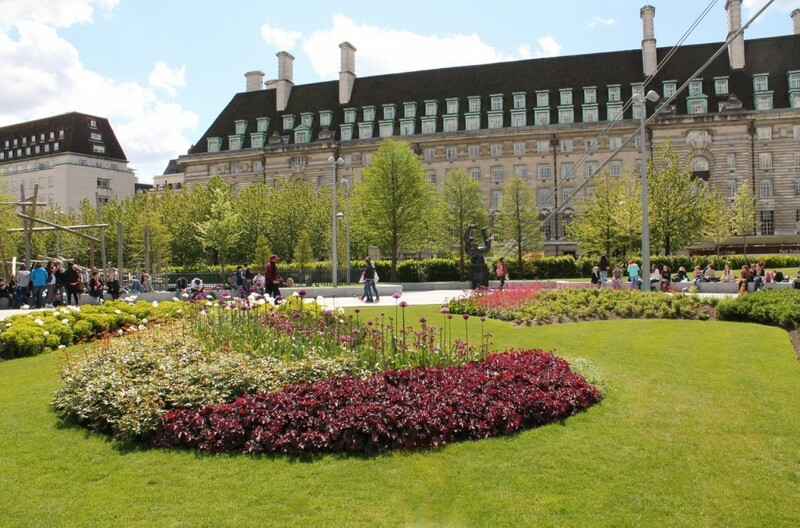 The planting of new summer flowerbeds has been completed in Jubilee Gardens in preparation for the first anniversary of the opening of the new Gardens which is on May 31 2013. An array of evergreen shrubs and flowering plants providing a beautiful display of colour is expected to last throughout the summer. Jubilee Gardens prepare to celebrate the first anniversary of their re-opening on May 31 2013 with a spectacular floral extravaganza of new floral species that give the gardens a new summery look and feel. The newly planted perennial shrubs and blossoming plants have already begun to produce flowers, which display a vibrant mix of colours such as yellow, pink, red, purple, blue and gold. 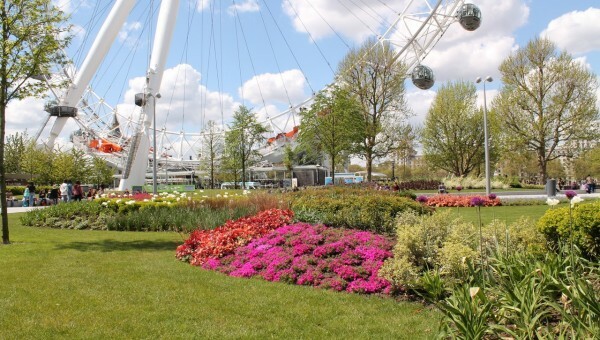 Already a hit amongst visitors and locals, the South Bank’s Jubilee Gardens have undergone a radical transformation from what used to be a lifeless patch of grass into one of London’s most cutting-edge green public spaces. The re-landscaped Gardens were first opened in May 2012 and officially inaugurated by HM The Queen in October 2012. Over thirty new varieties of shrubs and flower plants have been introduced in time for the summer season, including: Acanthus, Arkansas blue star, Bear’s Breeches, Helianthemum Golden Queen, Cytisus Praecox, Gladioli, Daylilies, Iris, Paeonias and Alliums. Evergreen shrubs were increased in quantity to ensure year-round green cover, creating a solid spine of colour. These species were enhanced by perennial flowers along the most visible sections of the flower beds. The newly planted flowerbeds were laid in smaller blocks, using spring bulbs for seasonal interest associated with the winter/spring transition. To prevent damage caused by visitors cutting through the Gardens some of the existing plants were relocated into more condensed evergreen blocks, which were bolstered up with permanent evergreen and woody deciduous shrubs. 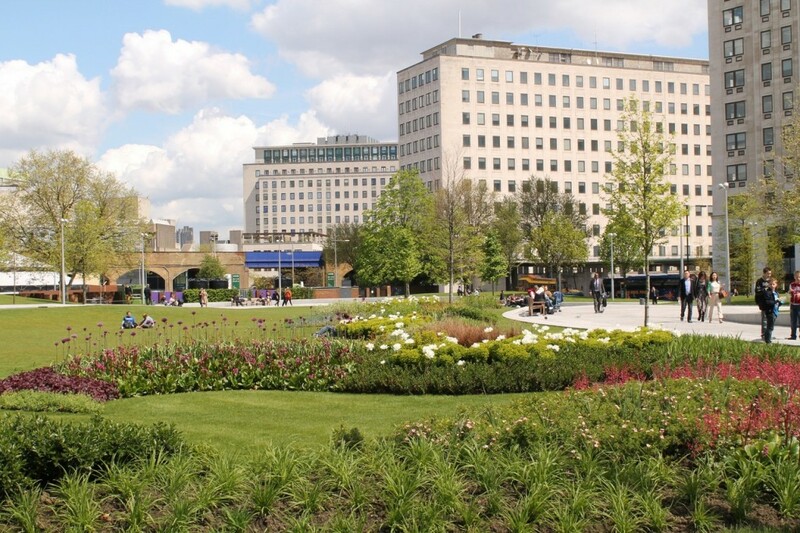 The original re-landscaping of Jubilee Gardens, along with the latest spring upgrades, was carried out by main contractor Frosts Landscape Construction and Applied Landscape Design Ltd. The planting of new species commenced in late April and was completed on the second week of May in time for the Gardens’ first anniversary on the 31 May.